Workers provide food to hundreds of migrants fleeing Central America at Tecún Umán's provisional shelter. Image courtesy of Yosef Sadipun. A video has surfaced showing a group of mostly Honduran migrants fleeing to take refuge in Mexico after hundreds of local residents – some armed with sticks and stones – confronted them in Tecún Umán, Guatemala. In the video, migrants can be seen running across the Puente Rodolfo Robles, a bridge connecting the two nations over the Suchiate River, as the local residents run after them. While fleeing, a group of three migrants appears to be carrying an incapacitated man to the Mexican side of the border. Video of three migrants carrying what appears to be an incapacitated man across the Mexico/Guatemala border. Video uploaded to Facebook by Gerson Suazo. The migrants were camping in the central park located at the center of Tecún Umán, a town nestled at the Guatemala-Mexico border where they were waiting for humanitarian visas for entry into Mexico. This group of migrants arrived in Tecún Umán in early January. Delegates of the Guatemala Human Rights Ombudsman report that there were approximately 3,000 migrants staying in Tecún Umán. Most were residing in the city’s two migrant shelters as well as in the city square. 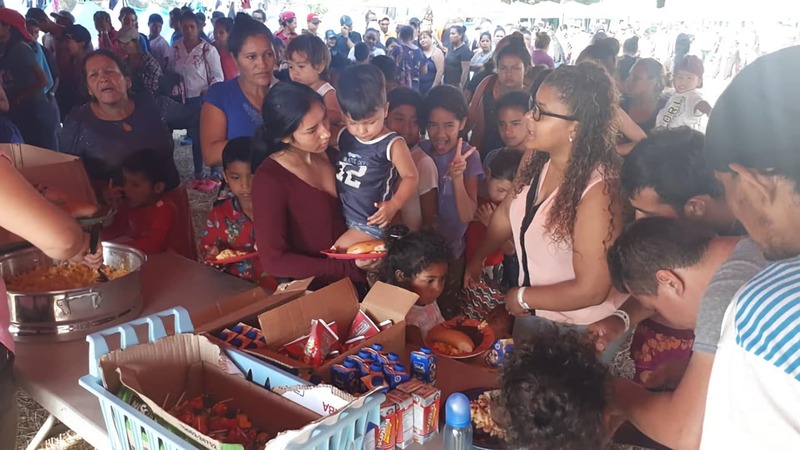 They added that municipal authorities there do not have the capacity to maintain shelters in the area nor have they provided enough humanitarian assistance or attention to the migrants. They concluded that the municipality has endangered both the migrants and the population of Tecún Umán. The migrants camping in the park have become a large source of frustration for the locals. 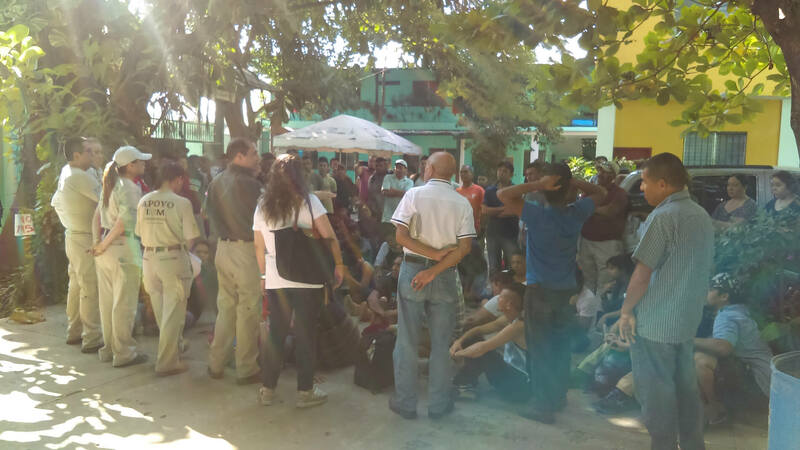 At mid-afternoon on Jan. 27, hundreds of residents of Tecún Umán confronted the migrants camping in the square. Gerzon Sausman, a Honduran migrant traveling with the caravan, captured parts of the confrontation on camera. “The mayor called his people to the square to a meeting to discuss the departure of the refugees who occupied the central park,” said Sausman. “He argued that he had already warned us to vacate the park as he had provided a place as a shelter. But [the provisional shelter] did not meet the conditions of a shelter.” But according to Sausman, before the mayor had even arrived at the square to speak, violence broke out. Locals of Tecún Umán, some with sticks in hand, confront migrants in the Central Park of the city. Video uploaded to Facebook by Gerson Suazo. At approximately 3 p.m. on the day of the confrontation, hundreds of residents arrived at the central park with sticks and stones in hand, insisting that the migrants leave the area as shown in videos posted online. The migrants then mobilized to the bridge connecting Mexico to Guatemala and were followed by the residents, said Sausman. Videos can be seen of locals with sticks in hand running down the bridge towards the migrants who were fleeing into Mexico. Sausman has watched the violence ignite from posts on social media. Tensions heightened after a video was spread on local social media and news outlets showing young migrants dancing at night in the central park. Another video was shared through the Facebook page Informativo Ayutla – a popular page where anti-immigration rhetoric has been exchanged about the migrant caravan staying in the town – showing the video of migrants dancing in the park, as well as images of migrants sleeping on the ground and benches, and litter and clothes strewn on the ground. The text in the video, posted at 1 p.m. on the day of the confrontation reads: “We give you food, shelter, even money. Now give me back peace and tranquility. You are not in your country. You are only showing that the problem in your country is yourself.” The Facebook video has been viewed over 18,000 times. Comments on Facebook posts included those calling the migrants “beasts,” “gang members,” and saying that all or almost all are “addicted to drugs.” In response to the video, one man commented, “Let’s go Guatemala, send them to Mexico” to which a woman living in Mexico responded, “We don’t want them to make mistakes here either.” “Gotta kill them,” the man replied. Other online news sources in the area contributed to the rhetoric. “It is unfortunate that these types of people come to our town to steal the tranquility, peace and security of our municipality, which has cost us so much to have every day…WE MISS OUR PARK, WE MISS PEACE IN AYULTA! Because they have invaded our territory,” posted Ayutla News. Father Yosef Albertman Sadipun, a 34-year-old priest who has been in Tecún Umán for the last several weeks providing humanitarian aid and was present for the conflict on the Jan. 29. Sadipun received reports that there would be a demonstration against the migrants at in the park, and so secured the 289 migrants living inside the shelter at that time, asking them not to go outside. The main banner of Casa Del Migrante. Image courtesy of Yosef Sadipun. Tecún Umán is a major port of entry for those traveling between Guatemala and Mexico. One permanent shelter, Casa del Migrante, was established in 1995 by the Missionaries of St. Charles Scalabrinians, an international Roman Catholic humanitarian organization. 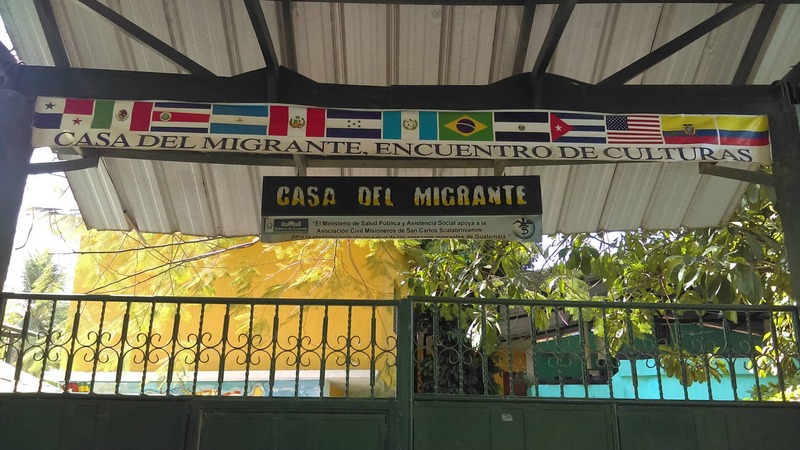 Casa del Migrante has been providing migrants with food, lawyers, social workers, medical assistance, and other personal needs and integral care. It is run by both Sadipun as well as Father Alfredo Tamarena. Under normal functioning, the capacity of the shelter is 80 people. But given the massive influx of migrants to the area, the shelter has been pushed to accommodate up to 300 people, said Tamarena. Staff meet with a group of migrants at Casa Del Migrante. Image courtesy of Yosef Sadipun. After working in the town intermittently for a year and a half, Tamarena is now also assisting with the operations of a new provisional shelter located at the entrance of the town. The provisional shelter was created by the local municipality in response to the influx of migrants traveling North from Central America and consists of several tents located in an open field. Workers provide food to hundreds of migrants fleeing Central America at Tecún Umán’s provisional shelter. Image courtesy of Yosef Sadipun. Migrants have complained that the living conditions in the provisional shelter are not sufficient. “The provisional shelter is primarily made of tents, with not enough beds for everyone so many are putting something on the ground and sleeping there,” said Tamarena. In contrast to Casa del Migrante – a permanent building – tents in the open do not shield migrants from Guatemala’s harsh temperatures. In Jan. 2018, the average peak daytime temperature was 91 degrees Fahrenheit. In addition to the lack of sufficient accommodations at the provisional shelter, it is much further away than the central park is from the port of the international bridge, Rodolfo Robles. This port is where applications were being processed for humanitarian visas that allowed migrants to legally gain entry into Mexico. Earlier in January, President Andrés Manuel López Obrador announced a new initiative granting one-year visas for migrants looking to enter into Mexico that would allow them to stay in the nation and work legally. These visas were issued far more quickly than standard processing times. As of January 28, Mexico’s National Institute of Migration reported receiving over 15,000 requests for visas from migrants mainly crossing the nation’s southern border. But on January 29, after thousands had applied and many visas had been granted, Mexico suspended the fast-tracking program. Those who already received their tickets are able to complete the process to get the humanitarian visa, but those who haven’t are out of luck, said Tamarena. For migrants who couldn’t obtain the visas any longer or decided not to, many crossed the Suchiate river into Mexico. Others continued to wait at the provisional shelter for their registration to go through, he added. After the confrontation in the square, the number of migrants in the area has lessened from nearly 1000 migrants in the provisional shelter to now only around 200 or 300, according to administration in the shelter. Garet Bleir is an investigative reporter working with Intercontinental Cry. You can follow his work on Instagram, Facebook, or Twitter.